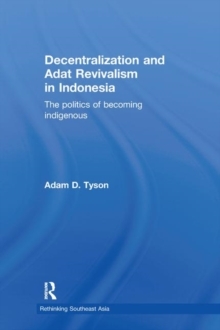 This book examines the dynamic process of political transition and indigenous (adat) revival in newly decentralized Indonesia. The political transition in May 1998 set the stage for the passing of Indonesia's framework decentralization laws. These laws include both political and technocratic efforts to devolve authority from the centre (Jakarta) to the peripheries. Contrary to expectations, enhanced public participation often takes the form of adat revivalism - a deliberate, highly contested and contingent process linked to intensified political struggles throughout the Indonesian archipelago. The author argues adat is aligned with struggles for recognition and remedial rights, including the right to autonomous governance and land. It cannot be understood in isolation, nor can it be separated from the wider world. Based on original fieldwork and using case studies from Sulawesi to illustrate the key arguments, this book provides an overview of the key analytical concepts and a concise review of relevant stages in Indonesian history. It considers struggles for rights and recognition, focusing on regulatory processes and institutional control. Finally, Tyson examines land disputes and resource conflicts. Regional and local conflicts often coalesce around forms of ethnic representation, which are constantly being renegotiated, along with resource allocations and entitlements, and efforts to preserve or reinvent cultural identities. This will be valuable reading for students and researchers in Political Studies, Development Studies, Anthropology and Southeast Asian Studies and Politics.